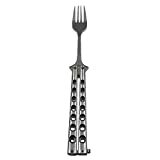 While the infamous butterfly knife is pretty much illegal in most places nowadays, there's no laws against other flipping utensils like these cool new Butterfly Knife Styled Spoon and Fork from Caliber Gourmet. 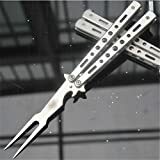 Inspired by balisong fan knives aka butterfly knives, these fun tactical spoons and forks also have two stainless steel handles that counter-rotate around the tang with a simple flick of the wrist. Perfect for quickly flipping out a spoon or fork from its compact, space-saving concealment between the handles and it also has a handy latch for securing the utensil when opened or closed. 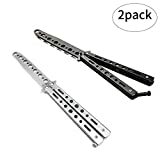 Best of all, it also doubles as a fun and safe way to practice butterfly knife flipping skills without all the accidental cuts, stabbings, and lost fingers.